Online DISC Certification - Become a trained expert today! Looking to start your own coaching endeavor or add new products to your coaching toolbox? Look no further. Earn your DISCflex™ certification and become a master at behavior modification. 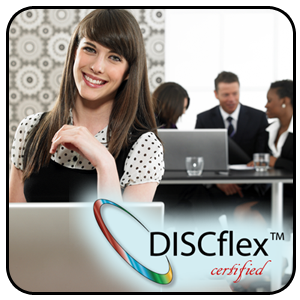 When you are certified in DISCflex™, you will have the ability to coach others through all of the DISCflex™ eLearning sessions. Take advantage of this unique opportunity to share your knowledge of behavioral flexibility with your clients. 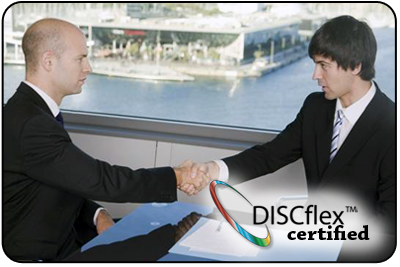 Upon completion of your DISCflex™ Certification, you will be immediately eligible to receive 30% off of all future DISCflex Purchases! Contact us to begin certification. Within 1 Business Day of your payment processing, we will email you a registration code. You will use the code to create a user account and to complete your DISC Assessment. Once you complete your DISC Assessment we will schedule a 90-minute training webinar with you to go over your results and the methodology behind materials. After the webinar, we will provide you with a Facilitator PPT to use DISC with other people. This PPT will include facilitator notes so you can lead the group. Certificate: We mail you a hard copy certificate once you have completed the webinar. You will be able to use this certificate to advertise that you are a Certified DISCflex Coach.